Ever since TSA introduced the “3-1-1” rule, it’s been a cramming of shampoo, conditioner, toothpaste, body lotion, facial cleanser, deodorant, and moisturizer — and who knows what other necessity — in 1-quart-sized bag to get through security. It’s a squish. Recently Savvy Traveler, a lifestyle products company, sent me samples of their various single-use wipe packets to try out. The wipes are marketed as an easier alternative to carrying on a bulky Ziploc or even having to pack it in a checked-in bag because you need that full tube of Colgate. Savvy Traveler’s line of wipes cover all the bases and are claimed as being TSA compliant. Sold in 4-packs and priced at $9.99 each, the wipes extend to antiperspirants, face and hand/body wipes, and hand sanitizer, plus for cleaning glasses and screens. There’s even a mouth wipe you gently rub your teeth with for a cleaner feeling minus the toothbrush. Although the $9.99 sticker might be a bit steep for some budgets (alas you can still get trial sizes in other ways), if you want to go bottle/tube free, the Savvy Traveler various wipes would work best. My assortment came in Savvy Traveler’s Liquid Kourage ($9.99) carry on bag, which fit all the six samples I got. The zippered pouch is see-through too so it should seem go through airport scanners with no problem, if you want to go beyond the sandwich bag. It’s also stylish. 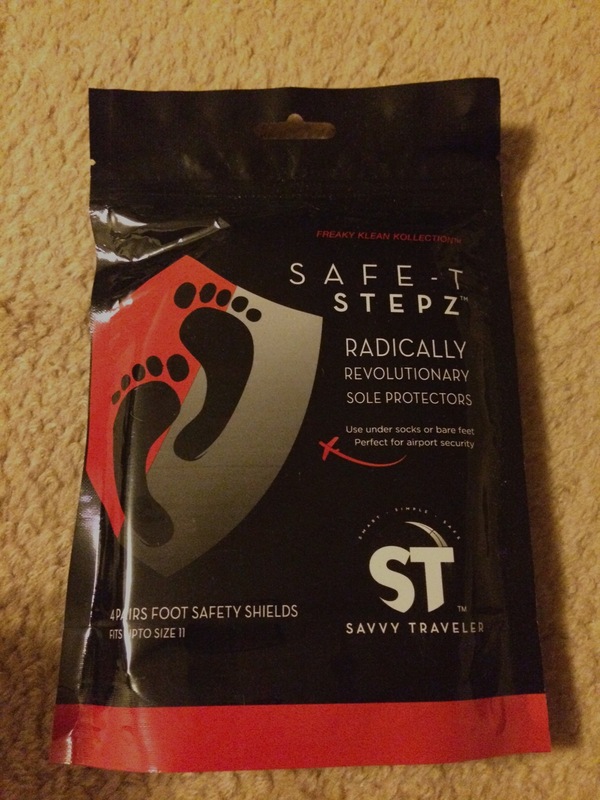 I also received Savvy Traveler’s Safe-T Stepz ($9.99). They are foot safety shields for use in situations where you’re still required to remove your shoes like at airport security. 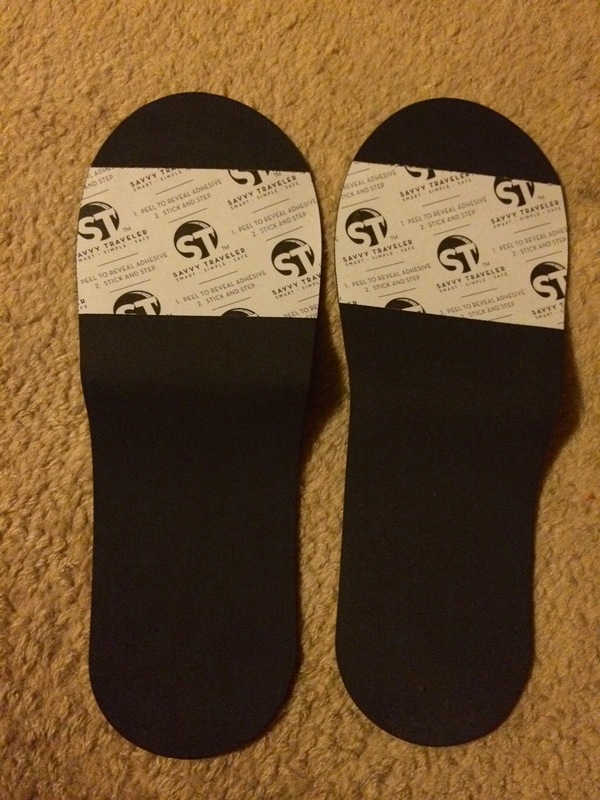 Each pack has four pairs and can fit up to a size 11. Press them on under socks or bare feet. From my experience, I can say that I found the adhesive on the Safe-T Stepz to be pretty strong. I put on a pair of shields under my bare feet and they stuck well but removing them was a bit of a pull. I tried another pair again but this time with some knee highs on; much better. For more information about Savvy Traveler, and their other products, visit their website. This entry was posted in Accessories and tagged Safe-T Stepz, Savvy Traveler, Savvy Traveler Wipes, travel accessories on June 4, 2015 by She Is Going Places.